When Charles II established the General Post Office (GPO) in England in 1660, he probably didn’t envisage that one day its customers would be queuing up to renew their passports in a glorified section of WH Smith. The Post Office handled the Royal Mail, after all. It was called the Royal Mail because his kingly predecessor, Charles I, was the one who first allowed people to use the royal posts to send their private correspondence. For about 350 years, the GPO was a monopoly that covered the sending of mail from a specific sender to a specific recipient. The first GPO opened in London in 1643, and there slowly grew a network of offices where eager senders could take their items. However, the sweeping postal reforms of 1840 turned a sprinkling of post offices into a rash. Until then, the charge for posting was based on the distance the item had travelled. The person who paid that charge was the recipient, and you did not have to accept the posted item if you didn’t want to pay for it. (A letter from the edge of the world, my good man? Send it back!) The 1840 Penny Post introduced both an affordable single postal rate (same price, no matter the distance) and the radical idea that the person sending the item should be the one to pay for it. Giddy with innovation, the GPO also introduced little adhesive stamps, which proved that the postage had been paid. As the postal service became more affordable to more and more people, Post Offices sprang up in towns and remote villages. They had to. The Government still requires the Post Office to maintain a network where 99% of the UK population are within three miles of their nearest branch. No wonder Post Offices were once housed in grand buildings, built to last forever. That’s because they were obviously going to last forever. Post Offices are still closing. The one nearest my house was recently earmarked for closure and had its very own petition and protest group. 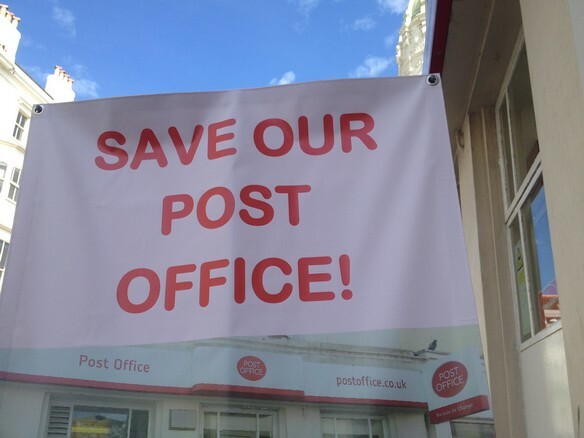 We want our Post Office! Times changed. People started sending emails rather than physical letters. Courier companies can deliver our parcels now that the GPO no longer has a monopoly. The rules changed so you had to have your benefits paid into a bank account, and could no longer cash them at the Post Office. You can pay for your road tax or TV licence online, without a trip to the High Street. Post Offices close because those Post Offices don’t make enough money. People get angry, as the Post Office is an essential for many of us. Yes, we love our Post Offices, but we simply no longer use them enough. We certainly don’t use them enough to warrant paying for large buildings in city centres to house them. So we sell them off. Welcome to WH Smith, King Charles! There is nothing some governments won’t close or sell off, given half a chance.